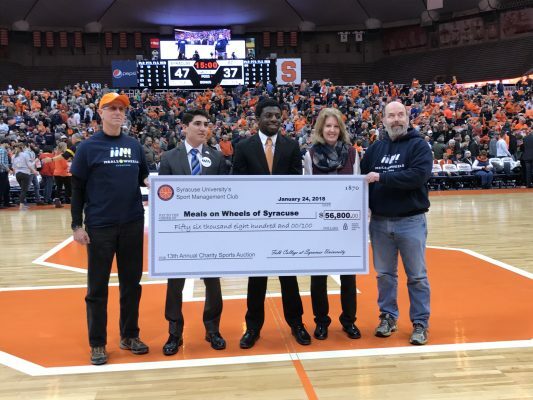 The Sport Management (SPM) Club at Syracuse University raised $56,800 for Meals on Wheels Syracuse as a result of its 13th Annual Charity Sports Auction. During the SU men’s basketball game on Dec. 9, supporters placed bids on hundreds of items, including sports memorabilia, electronics and tickets to major sporting events. In conjunction with the live event, Steiner Sports also hosted an online auction, which showcased a number of premium items up for bid. Meals on Wheels of Syracuse has been feeding our homebound neighbors since 1959. Its mission is to organize, plan and administer the service of delivering nutritious meals, nutrition education and resource assistance to people living in the community unable to do so for themselves. It provided more than 186,000 home delivered meals to 624 older and disabled adults in 2017. The SPM Club is a student-run organization in the Falk College of Sport and Human Dynamics’ Sport Management Department. Since its founding in 2005, the club has now raised over $412,000 for local charities. Previous beneficiaries of the club’s annual charity auction have included the Boys & Girls Clubs, Golisano Children’s Hospital at Upstate, the Ronald McDonald House Charities of CNY, the Central New York SPCA, the Upstate Cancer Center, Special Olympics New York, Food Bank of CNY, Make-A-Wish of CNY, the Salvation Army and McMahon/Ryan Child Advocacy Center. For more information on this annual event or to learn how you can help, please visit www.sucharitysportsauction.com.